For the first 12 hours after your spray tan avoid any activity that would result in sweating. Do not shower for at least 12 hours. During this time scrub your palms only when washing your hands. Do not rest your fingertips on your face or body, and limit skin-to-skin physical contact with others to avoid colour transfer. Pat your skin dry after showering and avoid any excessive rubbing with your towel. You can still shave while you have a tan; however, we do not recommend doing it daily. Always use a new razor and SunnaTan Coconut Oil to act as a buffer between the razor and your skin. Use our mild hydrating SunnaTan Grapefruit Mint Body Wash, for the duration of your tan. Do not use soaps and body wash with synthetic fragrances containing alcohol. Spray perfume on your clothes, rather than directly onto your skin. Face cleansers and moisturizers containing salicylic acid and/ or benzoyl peroxide are not recommended. Moisturize twice a day with a alcohol-free, paraben-free lotion. Use SunnaTan skin care products to help extend the life of your spray tan. Your spray tan tan does not protect you from the sun. Please use an alcohol-free sunscreen. 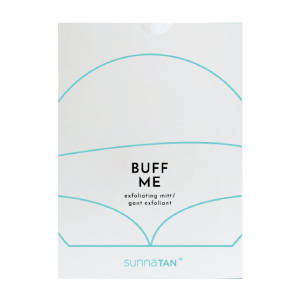 Use SunnaTan easy to use sunless tanning extenders to prolong the length of your tan, or use them on their own for a DIY glow. When your tan is beginning to fade, use our SunnaTan Exfoliating Mitt to help even out your skin tone and prep for your next airbrush tan. Shower 3-4 hours after your tan. You may notice that you do not feel as dark as you want to be at the 3-4 hour mark. Wash your palms 30 minutes after your tan, pat dry and moisturize your hands. Follow instructions to the left and do not touch yourself before your shower. During your first shower, simply rinse and do not use body wash or shave.